A wedding is planned for over several months, or years. It lasts for one very (hopefully) happy day and then the flowers are dried and hung, the presents are opened and used, or regifted. The dress is hung at the back of a closet or preserved, never to be seen again. 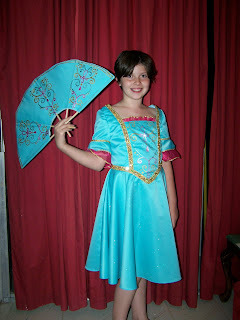 I always thought the dress was the best part of the whole day and it was sad it wouldn't be reused. 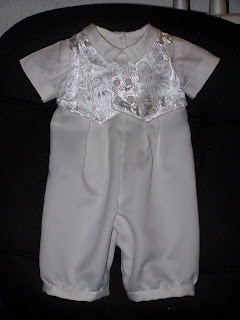 These items have been made out of various wedding dresses or special occasion clothes. 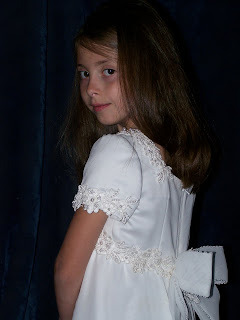 This Baptism dress was made out of my wedding dress. 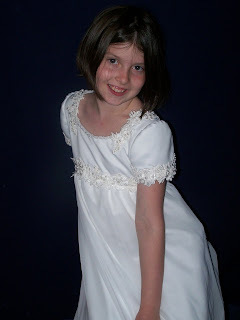 This is the same dress as above on my older daughter. 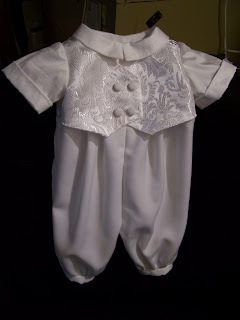 This outfit was made with new fabrics with buttons from the same wedding dress that was turned into the above Baptism dress. 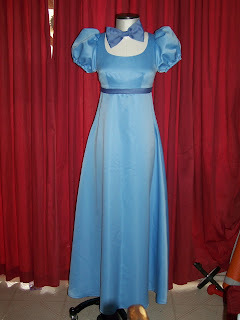 The rest of the dress will be made into a baby girl blessing dress in the future. 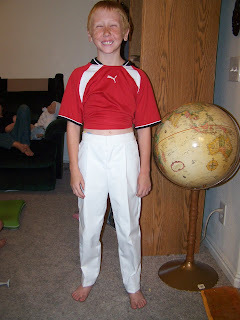 This outfit used fabric from the train of a wedding dress for the pants and the buttons on the vest are also from the dress. It has new fabrics for the shirt and vest. 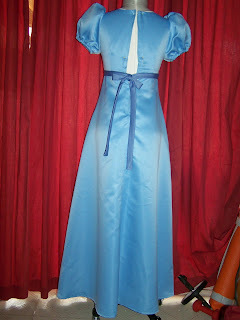 The rest of the dress will be turned in a baptism dress to be used next November. Holding onto the memories of my wedding day keeps them safe but sharing a piece of that precious day with children has made the memories grow by leaps and bounds. One of the perks of having a costumer for a mom is the fabulous Halloween costumes you get to have. Each year my kids pick what they want in late August or early September, they can change their minds up until the time that I buy fabric and then they're stuck. My middle daughter had a fancy store bought costume. I made something new! This little darling is headed to CA. I've decided to send a few items to a Boutique Sale my friend is running in WA. Here is the first piece. I will be working on a few other items in between the other things I have going on this month. It's my middle daughter's birthday (the brunette in the pictures) and Harvest Festival at my children's school and I'm PTSO President. It's our biggest event of the year. I have their Halloween costumes nearly done, only a few details are missing. My oldest is going to be the teal/green Musketeer and my youngest is going to be a duck. 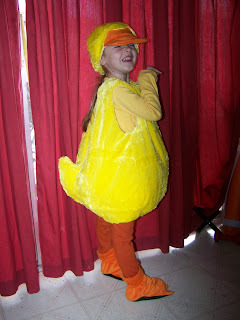 My middle daughter picked a costume I couldn't find fabric for so she got a store bought costume this year.